Continental Couture: Madras: India or Nantucket? Poverty or Prep? No self-loving prepster would wear rags, naturally. However, it got me to thinking about where the hell Madras came from (I with hold my opinion on this print for the time being). So where do I go? Like any good Yale research student: Wikipedia. Not only that, check out this cool link to a "History of Madras." It is actually kind of bogus, but I think the notion of a timeline of Madras history supplied by Google is quite amusing. Hmmm so Madras is actually from India? And not only India, but CHENNAI. Chennai is the home to the Madras Institute of Fashion Technology. Likely not the home of J. Crew designers, but I bet they make a kickass Sari. Now, if you are as big of a fan as I am, Chennai is actually the musical and cultural capital of India--particularly the heart from where we get movies like Slumdog Millionaire. If you are a fan of "Jai Ho" like I am, Chennai and therefore Madras got a whole lot more attractive from just a pair of plaid rags put together and sold for $150 at J. Crew. Funny thought though: If Chennai/Madras(its colonial name) was a British colony, essentially the entire print of Madras is a remnant of British colonialism and elitism. Some things never change I suppose. As much as the elite of the US wear madras, so did our British imperialists of yesteryear. Fashion changes. Style is forever. If you want to call Madras style, go ahead. It will be around as long as imperialism is. 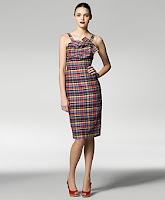 This Michael Kors Madras dress has a cut that even I, who normally avoids Madras, adore. The psychological contrast between a pencil dress and madras is huge for me. 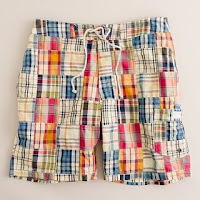 Madras is normally for wrinkled pants, a J.Crew dress out of the suitcase, or a cropped jacket. Here, the sharp lines, the tight and edgy little bow take the print to a new level. Perhaps not true madras, it at least as the audacity to reinvent the name madras as its own--almost as daring as the cute little slit up the back.